Scott Charlton is an accomplished author having written and published three business books, numerous strategy papers, guides and dozens of articles for a broad cross section of industry magazines and social media. It’s a very constructed, practical guide for financial planners. I think you have dealt with the cultural issues well and in particular how you should approach meetings to seek alignment. Despite the seemingly obvious synergy between accounting and financial planning, little attention has been given to this issue that is, until now! The fact that someone with such intimate working knowledge of both professions has devoted his attention to the issue is a significant benefit to participants on both sides of the “divide”. Scott has a unique understanding of the impact of FOFA and the broader regulatory framework as it affects both accountants and financial advisers. This understanding has been distilled into a range of informative insights and extremely useful practical tips for practitioners working together to improve client outcomes and their own businesses. I must say I really liked your book. It was a great read! I’ve finished reading your book and found the information to be highly beneficial – great work. I’ve enjoyed reading your book from cover to cover over the past couple of days. Well done on an excellent job documenting your years of experience. As I read, I often smiled to myself as I reflected on a similar journey. I liked the way the book explained how to practically apply some initiatives to promote financial planning services to accounting clients and to establish or resurrect a relationship with an accounting referral partner. Just like Men are from Mars and Women are from Venus, so too are accountants and financial planners and yet the convergence of advice provision denotes that we will need each other and our skills more than ever. Scott’s book is the most practical guide I have read that helps clarify the cultural considerations involved in building relationships and doing business with accountants to provide the great outcomes we all want for our clients. Scott, I have just finished “Partnering with Accountants”. Congrats on a fantastic reference book. While the book is geared towards Financial Planners it is very pertinent to my industry. I have a dozen or so pages dog eared for the ideas so we can change tack in approaching professionals. Thanks again! 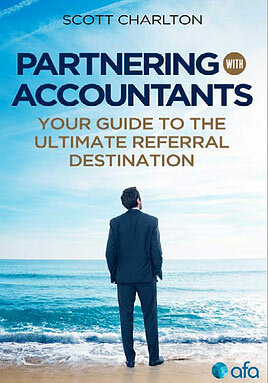 I’ve just read Scott’s book, “Partnering with Accountants”. His experience with accountants’ concerns and advice on partnering with them to provide financial services to clients has been valuable. I wanted to let you know I read your book from cover to cover while away, took it on holidays with us, so your book has been an appearance on the Great Barrier Reef. Interesting thing happened, while reading the book on two occasions I had accountants come up to me to have a chat. One from Melbourne and the other from Sydney. The conversation was light, but interesting all the same. I guess I could have swapped contact details, but I was happy with just practising some of the questions and techniques in the book mainly talking about their business. Now I am revising the book with an orange highlighter as this is a book that can also be studied as well as read.